Floor painting detail by Rukhe Zaidi, 2017. 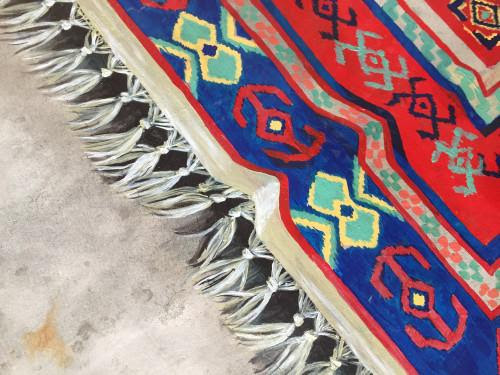 This month's banner - a rug that isn't a rug but a painting on the floor of the Artists' Barn-is the kind of work that surprises. It appears to be one thing, but, it literally (and translationally) fools the eye into seeing something that isn't there by compressing our eyes' focus. Pakistani artist Rukhe Zaidi created and gifted the piece to us during her residency last month. If there is a trompe-l'oeil continuum for humans (e.g. a scale with authenticity at one end and audacious fakery on the other), most artists I know are at the low end of the scale. Save for the occasional marketing pitch, serious artists are exactly who and what they say they are. As a species we are drawn to larger-than-life characters, so visual artists and writers with big storefronts and egos get a disproportional share of attention and money. It is the more subtle forms of human and artistic tromp l'oeil that intrigue me. Year in, year out, I watch artists at work interpreting the world in the most honest and authentic ways possible. Their work CHANGES the way we see the world-often turning something we think we know into something else entirely. In some ways, nearly every piece of art and literature is both tromp-l'oeil or anti-tromp-l'oeil. Art confirms our biases and rips them apart. It is the super power artists carry with them. It's a popular trope to say there is an artist in everyone or that everyone is an artist. I DO believe that immersing one's self in the creation of art regardless of talent or training is a journey to knowing one's self in a more honest way. Working with your hands to paint, your legs to dance, or your thoughts to keyboard, changes the way you experience the world. And those who do it for a living change US. It's an anti-trompe-l'oeil life (and a hard-knock one as well). 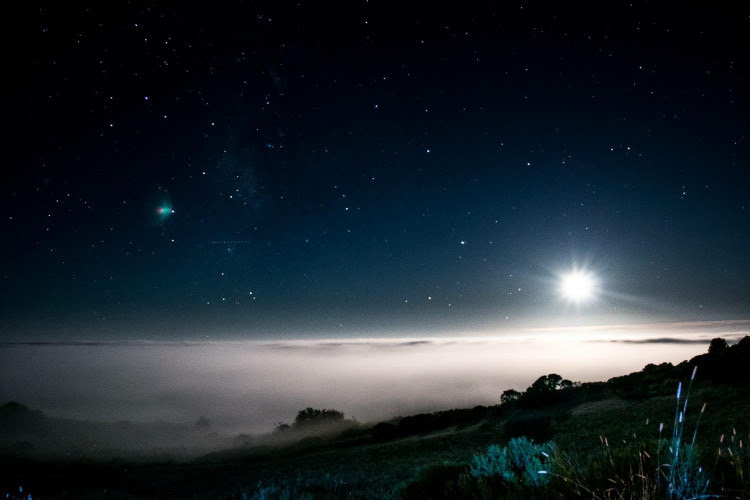 We open up the gates to the Djerassi Program and the talents of artists and scientists during our annual Open House/Open Studios-just around the corner on July 16. Join us. What you THINK you're going to see just may turn out to be something entirely different. All part of our evil plan to trick your eyes and hearts into a new appreciation for the value of the creative process. Have no fear - there will be actual pizza. Read more about the artists: Session 2 biographies. Coming soon: A great opportunity to reunite with Los Angeles area Djerassi alumni - Thursday, June 29. Meet your past, present and future friends who all share the "Gift of Time" experience. Host Heidi Durrow (2005, '13) will welcome us in Sherman Oaks, CA. More details to follow. Plan your trip to join us on the mountain Sunday July 16. Hours are 10:00 a.m. to 4:00 p.m. and features artists and scientists in the 4.0 version of what we call "Scientific Delirium Madness." Take a free tour of our grounds, watch Woodside Plein Air Painters in action, and see artist/scientist presentations. You'll meet scientists with an artistic bent and artists who combine their art with science and technology. Then chase it all down with some great pizza! Do it now! Purchase your ticket here! We celebrate Artful Harvest this October 8. Join us at our prized gala featuring delicious fare from the award-winning Village Pub, as well as art, wine and experience auction items, performances by our alumni, and a gorgeous sunset celebration (weather permitting). The Spring 2017 issue of Glance, California College of the Arts' news magazine, highlights several residencies around the Bay Area. The article displays the Program through the experience of photo-artist Mayumi Hamanaka (2016). Making Space, Diverse Bay Area Residencies Help Artists Flourish is available online here. Exploring the Djerassi grounds was suggested in an article in the SF Chronicle. "A new lust for art takes hold in Silicon Valley" mentions the Program with several other art venues such as the Pace Gallery in Palo Alto and the Cantor Museum at Stanford. Read more. Night photo by Weidong Yang, 2016. 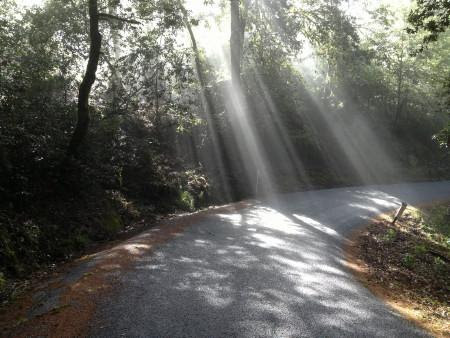 Howard Hersh (2004, winter '12) has been commissioned by the Montalvo Arts Center to create a sound installation that will be coupled to a hike through its forest environment. Watch this space as the premiere will take place in the spring of 2018. Robert Sward (1990, '91, '92) has been named Poet Laureate of Santa Cruz County, through 2018. Congratulations are in order. Dusan Tynek (2016) and his DT2 dance group have been awarded a residency by the City University of New York's (CUNY) Dance Initiative this fall. The work will be based on Leo Tolstoy's Anna Karenina. Adding the program's music will be acclaimed composer Aleksandra Vrebalov (2014). The collaboration should produce truly memorable work. 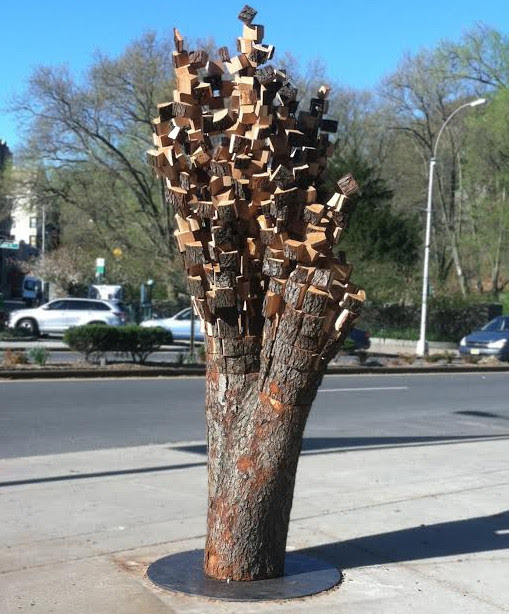 Anthony Heinz May (2014) has installed Common Denominator (photo), a reconstructed, "up-cycled" cherry tree, at the intersection of Dyckman St. and Riverside Drive at Tighe Triangle Park, New York City. The sculpture will remain in place until April 2018. 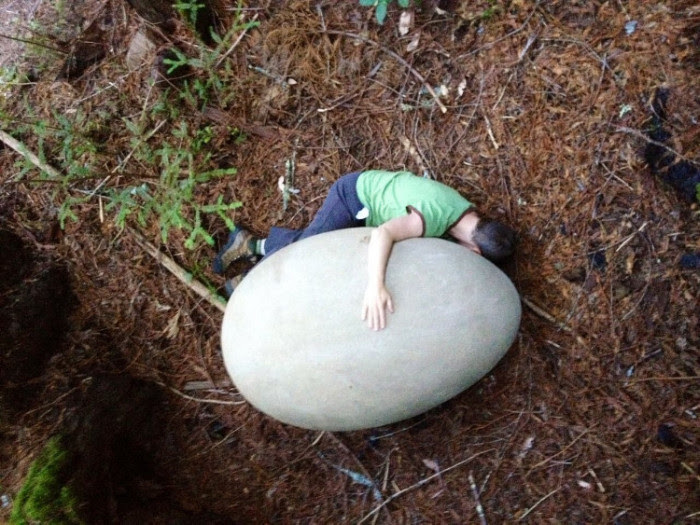 In April Terra Fuller, Djerassi's Development Manager, was a presenter at a webcast entitled "Residencies Within Reach," presented by the San Jose Institute for Contemporary Art. Emilio Rodriguez's (2015) work is discussed on Howlround.com in an article by Trevor Boffone, entitled Pedagogy Notebook: Responding to LGBT Homelessness in Emilio Rodriguez's Swimming While Drowning. Read it here. The Djerassi and Ucross (Wyoming) artist programs are part of a partnership fostered by The Ford Family Foundation of Oregon to sponsor visual artists. 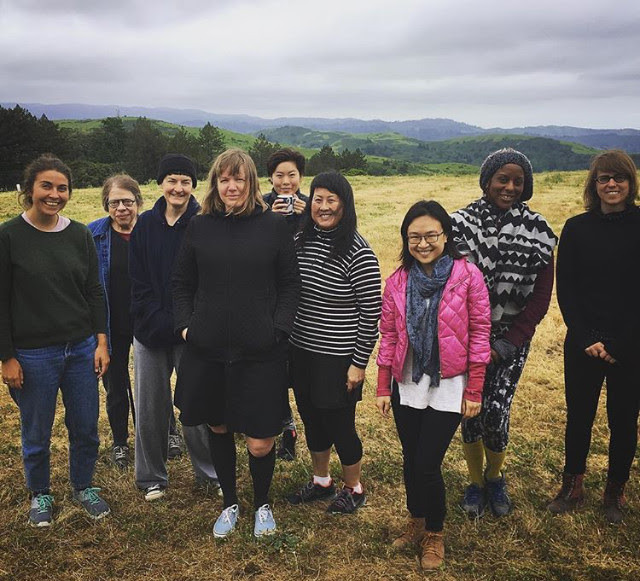 Read an article (Oregon Artists at Work - Djerassi and Ucross) about this union in the Alliance of Artists Communities' newsletter. Deborah Slater (1992, 4 winters, former Program trustee) Dance Theater completed 3 weeks of sold-out performances at Studio 210 in San Francisco. The show, TIME'S ARROW, featured original, live music by trumpeter Darren Johnston and his Trio (featuring Jordan Glenn and Dan Cantrell). Funded by the National Endowment for the Arts, the Rainin Foundation and the Zellerbach Family Fund, TIME'S ARROW was lauded in these comments from Brad Erickson (2014), executive director of Theater Bay Area: "I was really, really impressed with how precisely the characterizations came through ... It was lovely and moving, and I am always in awe of the dancers. Fantastic!" See more about Deborah and DSDT in CS&G Jul 28-29. Ashia Chacko (winter '12) reports that her documentary UNDERDOGS was a top-10 finalist for the competitive Roy Dean Grant/From the Heart Productions. The documentary was also awarded a Fleishhacker Small Arts Grant and a Pollination Foundation Grant. In other news, this summer, Ashia will be at residencies in and near Barcelona, Spain. Jiwdar and Rocaberti Writer's Retreat are the exciting opportunities. Mona Rae Washington (2016), playwright, will participate in "Philadelphia Assembled," a city-wide presentation of the arts coordinated with the Philadelphia Museum. The events will be held throughout the "City of Brotherly Love and Sisterly Affection" through July 17. The program moves indoors to the museum September through December. "Anyone who wants to know who I am can just read my lyrics." - Joan Jett. Let us know who you are by sending in your upcoming exhibitions, performances, premieres, events, book tours, etc. (as far in advance as possible) to ART///SKY. Email nick@djerassi.org. To follow our alumni and friends' events, be sure to check the D.R.A.P. Alumni Facebook page. 200 Larkin St, San Francisco. blueblack, dance performance, The Kitchen, 512 W. 19th St., New York City. Jacques Pepin: The Art of Craft, PBS American Masters series. Check local listings. Taboo - Transgression - Transcendence in Art & Science Interdisciplinary Conference, Ionian University, Corfu, Greece. See also Jun 11, below. Built, international juried exhibit of book art and architecture, 23 Sandy Gallery, Portland, OR. Discorporate, solo exhibition, Catharine Clark Gallery, 248 Utah St., San Francisco. Glass Wheel Studio, 128 W Olney Road, Norfolk, VA.
Lone Star, animation in collaboration with David Kwan, Tweetakt Festival, Utrecht, The Netherlands. Jun 3 Christy Funsch (2006, '12), performance in Group Motion's Spiel Uhr, Philadelphia, PA.
Jun 4 Donna Sternberg (2014) and her DS&D dance company. Transit Dances, appearing with JazzAntiqua Dance Ensemble and Arpana Dance Company. See site-specific dances at 3 Metro stops in Santa Monica, CA. 1000 Village Drive, Millville, NJ. Jun 11 - 18 Luca Forcucci, ISEA 2017 - electronic arts, Manizales, Colombia. Thru Jun 11 Adam Zaretsky, photos and prints exhibit at 11th Audiovisual Arts Festival, Corfu, Greece. Jun 15 - 18, 22 - 25, 29 - 30, Jul 1- 2 Brian Quirk (2014) (IM)PULSE, Seattle Repertory Theatre, 155 Mercer St., Seattle, WA. Thru June 17 Mari Andrews (1998, winter '08, '09) with Ann Holsberry Interconnections, new visual art. Olive Hyde Art Gallery, 123 Washington Blvd., Fremont CA. Jun 26 - Jul 1 Kimberly Dark (2011) Retreat focusing on pleasure, power and practice. Pahoa, Hawaii. See more at kimberlydark.com. Jun 22 - 24 Joe Goode (1991) 30th Anniversary Performance, Yerba Buena Center for the Arts, San Francisco. Jul 28 & 29 Deborah Slater (1992, 4 winters) and the DSDT's 6th Studio 210 Summer Residency presents performances by residents 13th Floor and Sarah Cecelia. Studio 210 Theater, 3435 Cesar Chavez St., #210, San Francisco. Thru Aug 27 Chris Fraser (2013) Your Mind, This Moment: Art and the Practice of Attention, group show, San Jose Museum of Art, San Jose, CA. A publication of Djerassi Resident Artists Program. Written and edited by Nick Walsh: nick@djerassi.org. 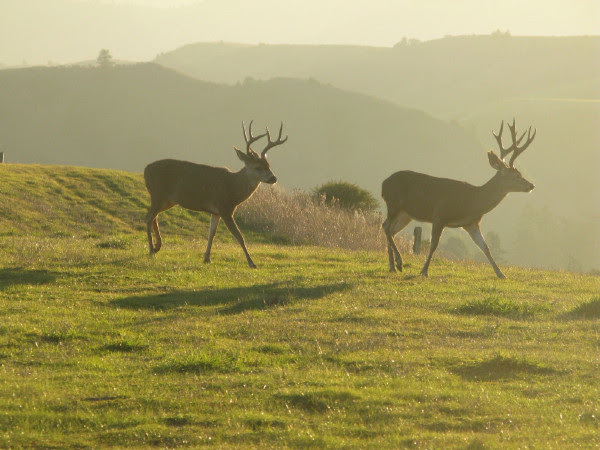 Deer photo - Djerassi archives. Other photos by N. Walsh unless noted. 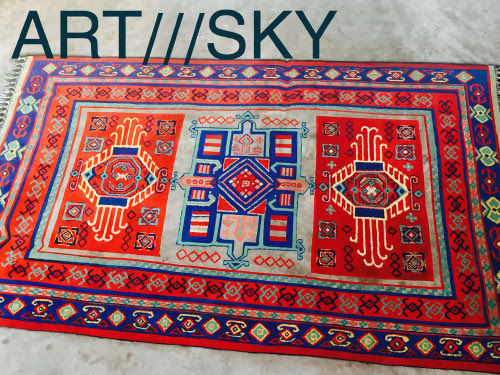 Banner and inset art: Carpet Painted on The Artists' Barn Floor, Rukhe Zaida (2017).